Break Through has a wide range of school programs and presentations for students, teachers and staff. We offer staff development training. They focus on disability sensitivity, diversity, and motivation. We have done speaking, training, and instructor in-service training at all levels of education. Since Ben has had a much broader range of education than most of us can experience, he has some interesting insights for both students and instructors. Tells it like it is (and was) from the perspective of a real kid. Helps build self-esteem, self-confidence, and hope. Shows how important it is to "Never Give Up!" learn how to relate more helpfully to those who have. participating in the same activities. "What is life like for her?" " Should I feel sorry for him?" " What could I do to help?" " Should I ignore her so as not to embarrass her?" And sometimes embarrassment makes it difficult for a student with a disability to escape the protective "box" they've built around themselves to join effectively with their fellow students. Ben's presentation helps students to learn to respond constructively to such challenges and to come away with a more positive attitude toward each other. He also helps those who have been struggling with their disability to feel more effective and hopeful. In a creative, sometimes humorous, highly anecdotal presentation, Ben describes what life is like for a student growing up with cerebral palsy. He discusses where he found his strength and hope, gives tips on how to relate effectively to a person with a disability, and teaches us all that we must "Never Give Up!" During 2012, Mr. Anderson received two grants from the SD Council on Developmental Disabilities to provide disability awareness and bullying sessions to schools across the state. In addition, he presented at several places of worship. Mr. Anderson traveled across South Dakota during April and October 2012. He spoke to thousands of students, teachers, coaches and community members - sharing his life story and providing information on bullying and why it needs to stop. If you have any questions, please contact me at 605-773-6369. Contact us for more information on having Ben speak at your school. “ Hearing Ben Anderson speak was truly inspirational." “I cannot imagine anyone who hears Ben’s story to not leave with a smile and a new sense of determination toward life...I know I did” These are but a few of the overwhelming positive reflections shared by students after attending a one hour talk by Ben. He truly captivated our hearts and minds with his message. Ben's book is presently being used at two universities. It is a textbook at UW-Stout and at Minot State University. 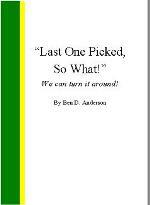 Ben spoke in K-12 schools in Wyoming in 2013.
parent groups, parent /teacher groups"
30 page booklet for educators and high school students with special needs to know they can and should attend higher education. "Last One Picked, So What!